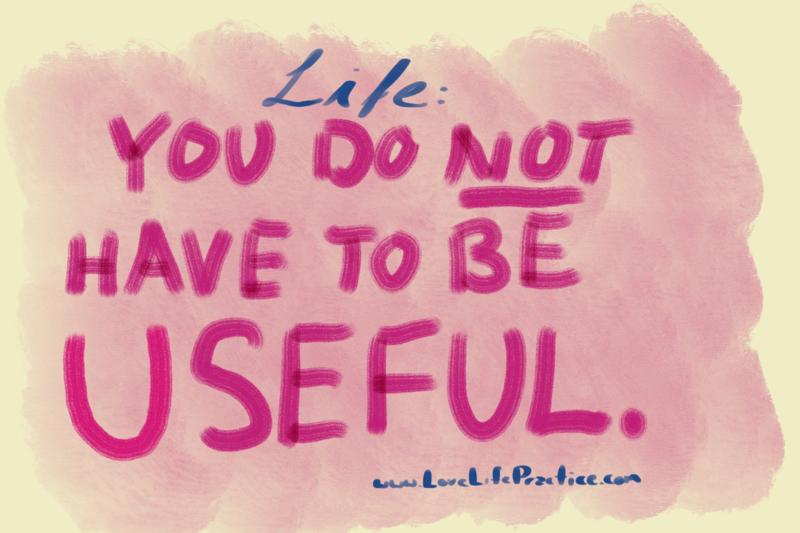 You Don’t Have to Be Useful – Love. Life. Practice. I don’t normally call out my fellow personal development bloggers, but yesterday I read a post so headdesk-worthy that I knew, in an instant, that I had to write a response. Why do we do these things? To be honest, I don’t care what the exact reason is. I’m not a scientist. All I know is that it has something to do with history, culture, media, economy, psychology, politics, the information era, and you name it. The list is endless. Let’s just accept that. Most people love to analyze why people are not happy or don’t live fulfilling lives. I don’t necessarily care about the why. Let’s paraphrase: I don’t actually have any knowledge about this, nor do care to take the time to get any. So rather than identify what we want to change, let’s just let speculation take the place of facts. There are facts, by the way. People like Dan Gilbert and Brené Brown have done a lot of research figuring out the “why” of people’s happiness or lack thereof, and they’ve used that research to help find a few ways to help people be happier. And yes, one of those ways (indicated by the research of Dan) is to be of service to others. That has, in fact, made some people happy. Of course, throughout history we have seen people who try to be useful. Look at the industrial revolution! Look at Manifest Destiny! At the invention of the automobile, and the pioneers and remember the Alamo…oh, wait. The Alamo was a bunch of Texans living in Mexico who were pissed off that they couldn’t own slaves. Well, maybe don’t look at that…in fact, those other things also weren’t so good. The idea that your purpose is to be useful predicates the idea that there are times when you are not useful. It promotes the idea that there are people who are, in fact, useless. But who gets to decide? And when we say “useful”, the question also arises: useful to whom? I’m sure the people at a conservative political rally are very useful to the conservative movement; personally, I don’t find them very useful. But remember, the Dunning-Krueger effect is about people who think they know more than they actually do. In other words, while I might not find them useful – I am almost certainly wrong. The presumption, the arrogance, the ignorant overconfidence of thinking that you can tell whether anyone else is useful or not, or even whether your own actions are useful or not…it staggers the mind. In the article, the writer suggests that instead of indulging in experiences like watching TV, going to a concert, or eating a fancy meal, we should occupy our time with tasks that would be “useful” to the people around us. I’m all for helping people, of course, but I’m wary of the arrogance of someone who thinks they know what someone else wants without taking the time to figure it out. The author, if he’d taken the time to think about it, would probably have been better off to call the article “How to be happy by feeling like you’re useful. But that doesn’t get the clickbait. Back to the point, it has been shown – repeatedly – that taking time to enjoy a fancy meal, to listen to music, to enjoy a good story, all of that is not only useful but it is essential to a healthy life. Oh, it also is useful, if you need to frame it that way, to the chef, the musician, and the actors, and everyone else engaged in producing these things – not because they’re useful, mind you, but usually because they make people happy. Hate to break it to you, but my personal view is: there isn’t one. Yep. Life does not have some grand plan, some ultimate framework of destiny in whose web we are all irrevocably entwined. I don’t believe that for a second. And that’s great. Because without some external purpose, the only rational thing to do is to live as well as you can. To enjoy things, to revel in this amazing and frustrating and beautiful world, to gawp in wonder at the cosmic coincidence that leads you into one magical moment after another. Sometimes that’s a chord in a song. It’s wiping a tear from a child’s face as they smile at the dinosaur bandaid you gave them. It’s biting into a warm chocolate lava cake. It’s feeling the burn in your legs as you help lift lumber into a truck. It’s gasping as Supergirl is beaten by the villain on the TV. It’s ink on paper, or pixels on a screen, or seeds in the earth, or words whispered in your ear. If “feeling useful” is part of how you do that, great! But if you find satisfaction just laying there in the sun, enjoying the fact that you are alive – that’s great too.